Ensure your potted plants remain hydrated and healthy using this Plant Nanny Small Spiral Watering Globes with Stakes Package. 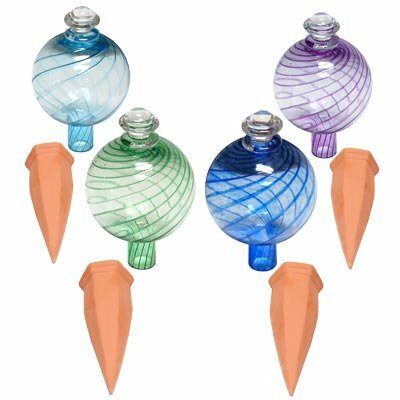 This set provides 4 different glass orbs and terracotta stakes, for watering a few plants with ease. The colored, spiraling lines, rounded finial, and glass construction on these globes make them elegant accessories for your favorite plants, while helping them stay watered. Each glass orb holds 12 ounces of water, while the aqua, blue, purple, and green colors of them capture attention. A terracotta stake supports each reservoir, and inserts into the soil of your plant in moments. The slightly porous nature of terracotta allows water to gently seep out of the stake when the soil and roots around it are dry, for a deep and consistent moisture level. Place each stake near the center of your herb, or close to its roots, to keep it healthy and robust. The glass reservoirs remove from each stake in moments for refilling, and the convenient size of the pieces helps you water a few flowers or small shrubs at once. For added versatility, place all of these globes in a single plant to keep it hydrated while you are on a trip. Provide plants the water they need in a stylish way with this Small Spiral Watering Globes with Stakes Package. This package includes 4 Plant Nanny Spiral Watering Globes with Stakes. One 12 ounce globe of each color (aqua, green, blue, and purple) is included.